Researchers a Swiss Federal Institute of Technology, Lausanne have developed a technique that can be used for both, fabricating bio-inspired robots and secondly, furnishing them with higher configurations. Their newly constructed platform also helps in examining and researching robot designs along with their various modes of locomotion. Result of their platform is the production of complex yet reconfigurable microrobots – the nanobots can change their own shape by rearranging the connectivity of their parts- with high throughput. The embedded manipulation platform can operate and control the bots’ locomotion through electromagnetic fields. With respect to traditional microrobots, these nanobots are soft, flexible and motor-less. Their basic structure consists of biocompatible hydrogel and magnetic nanoparticles. These nanoparticles help the microbots in reshaping and locomotion when they are under the influence of electromagnetism. 1) A layer of biocompatible hydrogel is placed wherein nanoparticles are introduced. 2) Then an application of electromagnetic field is done for aligning the nanoparticles at different parts of the robot. 3) Polymerization – forming polymer chains or three-dimensional networks from monomer molecules through a reaction process – follows next to solidify the hydrogel. 4) The robot then is placed in water where it creases itself as per the orientation of the nanoparticles inside the gel, thus, forming the 3D architecture of the microrobot. 5) Once the 3D architecture is achieved, an electromagnetic field is applied and consequently, the microbots start swimming. Further, upon heating with a laser, these nanobots are seen unfolding and hence changing shape. This entire process of fabrication helped researchers in creating bio-inspired microbots that imitate bacterium that leads to African trypanosomiasis, also known as sleeping sickness. The concerned protozoon makes use of flagellum for locomotion but conceals it away upon entering a person’s bloodstream as a survival mechanism. Researchers came up with a design that works on the similar parameter. 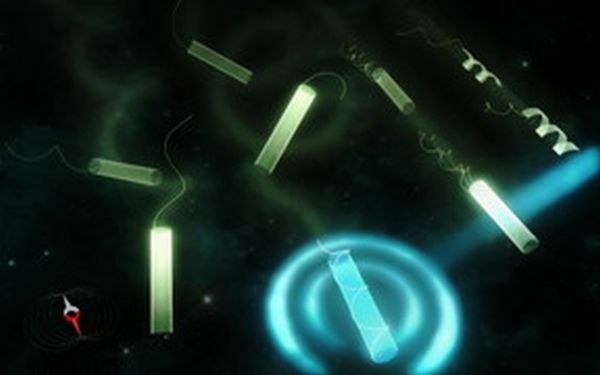 The prototype micorobot has the same bacterium-like flagellum for propulsion mechanism, which upon heating gets coiled around the robot’s body, thus giving an impression of hidden flagellum. As for the current scenario, the development of microrobots is still in its infancy. A significant amount of research is yet to be done before the researchers are sure that these microrobots won’t cause any side effect when used in medical application.